And while we’re talkin’ night creatures as I was yesterday, how can I forget the time I came into the kitchen at 6am, sleepily reached for the uncapped plastic bottle where I keep my vitamin C, and, while the coffee was brewing, tipped it up toward my mouth…. 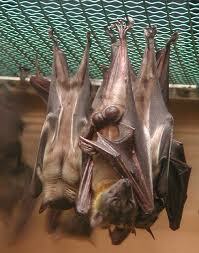 Only to find alive and sleeping bat folded up inside it like a gentleman’s umbrella. all were mere inches – nay, centimeters from my open mouth. Posted in humorTagged bats, do not swallow, surprise! So could I (scream) …. in fact, I did! Gonna have nightmares tonight! Peggy, then I’ve done my job ha ha! I bet you cap your vitamin bottle now! That must be a huge vitamin bottle, or was it a miniature bat? Terry, when did this happen? I loved the bats in my back yard, and they’ve disappeared over the past couple of years. I’m so worried that they’ve succumbed to the white nose virus that’s killing so many of them! is it now in the belfry?